You can use this page either to ask complementary information, or to make a booking if you have already a precise idea on your stay. This is a route description for a taxi driver in the Thai language. You might want to print this out in case you need it. You can also print the sketch on the right or use the interactive map below. 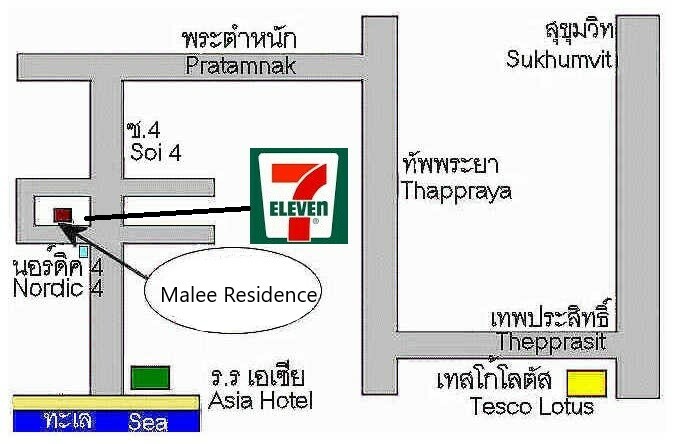 Malee Residence is very easy to find when you arrive to Pattaya because it is located on the only height of the city. Ask either for Pratamnak or the Asia Pattaya Hotel. When you enter Soi 4, go downhill until you find the Nordic Terrace sign. Malee Residence is right after Nordic Terrace, you cannot miss it. On your arrival at the airport in Bangkok it is very easy to get a taxi driver to bring you to our apartments. After the bagagge check and the customs there will be many drivers waiting to drive you to Pattaya. Copyright © Malee Residence Co., Ltd. All rights reserved 2005-2019. Enjoy your holiday at Malee House or at Malee Residence in Pattaya, Thailand.